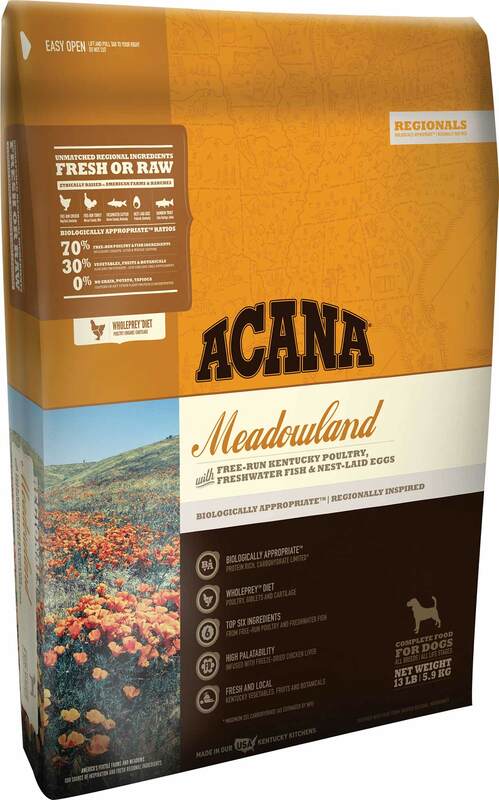 Biogically appropriate and regionally inspired food from Acana that uses the finest real ingredients to satisfy your dog's health and taste. Acana Meadowlands — filled with free run Kentucky poultry and eggs, as well as responsibly caught freshwater catfish and rainbow trout — is 70% meat. The rest is fulfilling and healthy whole food vegetables like kale, butternut squash, collard greens, carrots and apples, with additional supplements of turmeric, rose hips, sarsaparilla and probiotics. Your dog's evolution requires a whole meat diet rounded out by healthy vegetables and natural ingredients. Where most dog foods are filled mostly simple carbohydrates like rice or tapioca, a mostly meat food like Acana prevents spikes in your dog's blood sugar and prevents weight gain, keeping your dog happy, healthy and strong. Deboned chicken*, deboned turkey*, chicken giblets* (liver, heart, kidney), turkey giblets* (liver, heart, kidney), chicken meal, catfish meal, whole green peas, red lentils, pinto beans, pollock meal, chicken fat, chickpeas, green lentils, whole yellow peas, sun-cured alfalfa, whole catfish*, whole eggs*, rainbow trout*, herring oil, natural chicken flavor, chicken liver*, chicken cartilage*, dried kelp, whole pumpkin*, whole butternut squash*, kale*, spinach*, mustard greens*, collard greens*, turnip greens*, carrots*, Red Delicious apples*, Bartlett pears*, freeze-dried chicken liver, freeze-dried turkey liver, pumpkin seeds, sunflower seeds, zinc proteinate, mixed tocopherols (preservative), chicory root, turmeric, sarsaparilla root, althea root, rose hips, juniper berries, dried lactobacillus acidophilus fermentation product, dried bifidobacterium animalis fermentation product, dried lactobacillus casei fermentation product.